After five months of negotiations, Syriza’s choices remain the same: capitulate to Greece's lenders or break with the euro. It appears that five months were needed for the Greek government to finally withdraw from a process that has been exhausting for the government itself and society as a whole. This was the time required for a (perhaps temporary) end to be put to the repayment installments to the creditors and for Syriza to issue a call for reactivation of the popular mobilization that was interrupted by the catastrophic agreement of February 20. With the public coffers empty, with the economy reeling from the effects of the liquidity strangulation implemented by the European Central Bank, with the population in a state of inertia and confusion, the question arises as to whether all these last-minute initiatives, apart from being insufficient and unprepared, have come too late to make any difference. Whether, in other words, it is possible to make up for the time that began to work against the Greek government from the moment it tried to present as a “negotiating success” its own inability to exert the slightest influence on the stance of the creditors. So, despite the verbiage about “progress” and an “imminent agreement,” what the latest developments have come to confirm is that the last five months have been nothing but a parody of “negotiations.” Because how else can one characterize a procedure where, after four months of alleged progress, the proposal — or rather the ultimatum — put forward by one side is, as Greek Interior Minister Nikos Voutsis has confessed, a particularly loaded variant of the proposal that was on the table at the outset. In other words, the agreement accepted by the previous right-wing Greek government. The least one might expect, after such a provocation, is a walkout. The most crucial thing, though, if we don’t want to see a repetition of this nightmarish scenario, is the public acknowledgement that this procedure was a trap in which the Greek side was ensnared, with very painful consequences, which can be rectified only by a radical change of course. However, the time that was lost through these interminable “negotiations” was not a loss for everyone. Clearly there was no loss on the side of the lenders, who are continuing with absolute consistency the “liquidity stranglehold” strategy inaugurated by European Central Bank President Mario Draghi just ten days after the elections. And it has achieved something that — at least in the eyes of those who supported the project of a left government, and contributed to its coming to office — would have been seen as inconceivable a few months ago: drawing a government that was elected to break with the neoliberal “shock therapy” imposed by the memoranda into accepting a marginally modified framework of austerity policies. How else can one characterize the incredible “forty-seven page text,” as the latest completed version of the Greek proposal has been designated. It is a document that moves within the familiar, indisputably memorandum-oriented, logic of fiscal surpluses, privatizations, repeated increases in the official retirement age, consolidation of the extortionate overtaxation of recent years (with a parallel increase in indirect taxation), reduced protection for the primary residence, and relegation to an indeterminate future of the near totality of Syriza’s programmatic commitments that have not already been virtually retracted. Let us be clear about this: though there has been a continual slippage in the Greek positions throughout the so-called negotiations, the new text marks a turning point. Even if the proposals of the Greek side were to be accepted as a “basis for discussion” — and we know that since they were made there have been further steps towards alignment with the demands of the lenders (the most characteristic being full acceptance of the targets of fiscal surpluses) — the result would still be continuation of austerity and entrenchment of the memorandum regime. In that sense we can say that the violation of the popular mandate has already occurred. 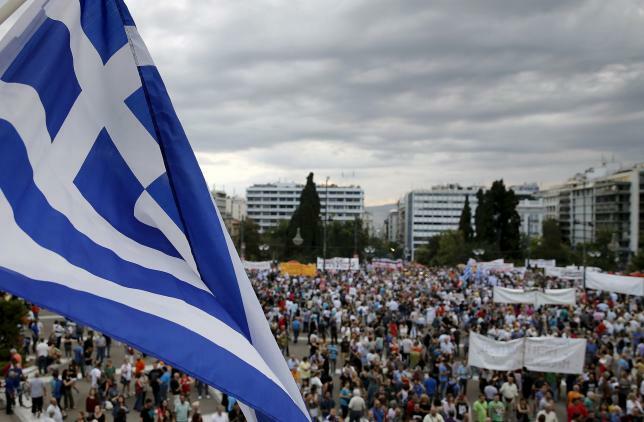 But the “lost time” does not apply only to the continual backtracking by Greek negotiators. Equally crucial is the demobilization of society, the constant lowering of expectations, the sense of impotence that is becoming generalized. The break here came with the February 20 agreement that put an end to the climate of hope and the combative mood that had been triggered by the electoral victory of Syriza in January. The official discourse of the government has been a decisive factor in that process, as well as Syriza’s inability as a party to strike a different tone. What prevailed in the end, and continues to some extent on its posthumous course, was the interminable “negotiationology,” the never-ending song and dance on the subject of the imminent “agreement” and the allegedly “honorable compromise,” interspersed from time to time with truculent outbursts that hint at a “rupture” — but without ever preparing it or explaining it as a viable and positive option. But it surely can come as no surprise when the delayed, improvised, and imprecisely targeted summons to popular mobilization such as that issued on June 17 should be greeted with skepticism. It has become abundantly clear that the government, but also Syriza generally, is confronted with a credibility problem. How credible can it be to declare, as Alexis Tsipras declared on June 16 to his party’s parliamentary group, that “the real negotiations are starting now” at the end of the exhausting five months that have passed? What is the point of reiterating, as he did in the same speech, the assessment of a “positive February 20 agreement” when more or less everybody perceives that they have tied the hands of the government without securing the slightest relaxation of the liquidity stranglehold? How many people still believe that the “Brussels group” and the “technical teams” are something different from the troika, that the so-called “fifth review of the current program” has been taken off the table, when it is in the title of the forty-seven-page document of the Greek proposals, and even that there is no memorandum anymore? Aren’t these continual verbal tricks in any case an implicit avowal of failure (when we can’t change something we change its name) and at the same time a symptom of progressive breakdown of the language of politics generally? With his monumental work “In Search of Lost Time,” Marcel Proust demonstrated what Heraclitus had encapsulated in his famous quotation, “You cannot step twice into the same river.” The lost time is irrevocably past and its revival, as guided by memory, is impossible except as narrative reconstruction operating at another level, that of language and imaginary reinvention. And to achieve this, Proust ceased living. He arrested the flow of time, as it were, for himself, so as to allow his writing to stage its confrontation with the experience of loss. But, even so, this French writer has something pertinent to say to those who choose to do the opposite of what he himself did, to those who continue living and acting in this world, with an awareness, though, that everything retains a trace of the past, which is nothing else than the savor of the unfulfilled. Only the creation of new time can vindicate what has been wounded by time past. In that sense nothing has greater relevance today than Syriza’s program, than the commitments it undertook and which made possible its historic electoral victory. Not despite but precisely because we know that its implementation cannot happen in the way we initially imagined. A new start does not mean a beginning from square one. But neither is it possible without a break from what has gone before. The government, Syriza, the people of Greece, today find themselves confronted by a dilemma which can be formulated in an abruptly simple way: capitulation or a break, surrender or an open wager with the future. The latter option undoubtedly entails risk, but the former has nothing to offer but the security of deathly, interminable agony. Pavlos Zannas (1929–1989) started translating the work of Marcel Proust in the prison to which he had been consigned for his action against the military dictatorship. When his fellow prisoners, or later commentators, asked him why, in the given circumstances, he had not chosen to engage himself with something “more political” he said that to translate Proust precisely in those circumstances was a political act par excellence and an inseparable part of his activity in the resistance against the dictatorship. Dedicated to the memory of Pavlos Zannas.